The International World Extreme Medicine Conference and EXPO 2012 is calling for abstracts from university wilderness medical societies (or equivalent) or university medical students with any interest in extreme medicine. Some scenarios to get you thinking! From the entries, Expedition & Wilderness Medicine will select the top 10-15 and invite these to present their posters at the World Extreme Medicine Conference and EXPO 2012 at 1 Wimpole Street home of the Royal Society of Medicine. Presentation will be in the Events Dining Room. An award will be given to the best poster presentation as voted by one of the guest speakers – and will look great on your CV! Expedition & Wilderness Medicine (EWM) is delighted to launch the International World Extreme Medicine Conference and EXPO series website. The conference will be held at One Wimpole Street, home of the Royal Society of Medicine, in central London, from 15th April to 18th April 2012. The conference will deliver four days of CME-accredited knowledge, insight and innovation in the field of remote medicine and its sub-disciplines: expedition and wilderness, pre-hospital and, disaster and relief. Delivering these messages will be speakers who are amongst the global leaders in remote extreme medicine, who are ideally placed to provide expert knowledge transfer to delegates. As you are aware, over the past ten years the care of casualties has significantly improved. Often, this has been driven forward by conflict, the exponential rise in natural disasters and our capacity to respond on an international scale. All of this is concomitant with a growing interest and recognition of remote and expedition medicine which has triggered the need for an extreme medicine conference. Developed specifically with medical professionals in mind, the International World Extreme Medicine Conference and EXPO also welcomes medical specialists (nurses and paramedics) and a number of university medical students. Expedition & Wilderness Medicine look forward to meeting everyone at this exciting hallmark event. Doctors urgently required for Luangwa Valley Safari Association in Zambia from December 2011. You will live and work near Luangwa National Park, a remote and beautiful area famous for its wildlife. Find out more about this position here. 10th – 11th September* if based locally. Across the Divide Expeditions require a couple of additional salaried medics to help provide medical coverage on this iconic and stunning fundraising trek raising much needed funds to support the work of Oxfam. Trailtrekker Ireland website. 21st – 25th September* if based locally. In aid of SSAFA, the Soldiers, Sailors, Airmen and Families Association this is a great bike ride descending from Edinburgh and finishing in London covering 450 miles. An experienced medic is required to assist one of the best event teams in the country to provide medical cover fwith a mixture of time spend cycling and driving. SSAFA website. 22nd – 27th September* Cambridge – Brussels – London. More detail on the EWM Internship. 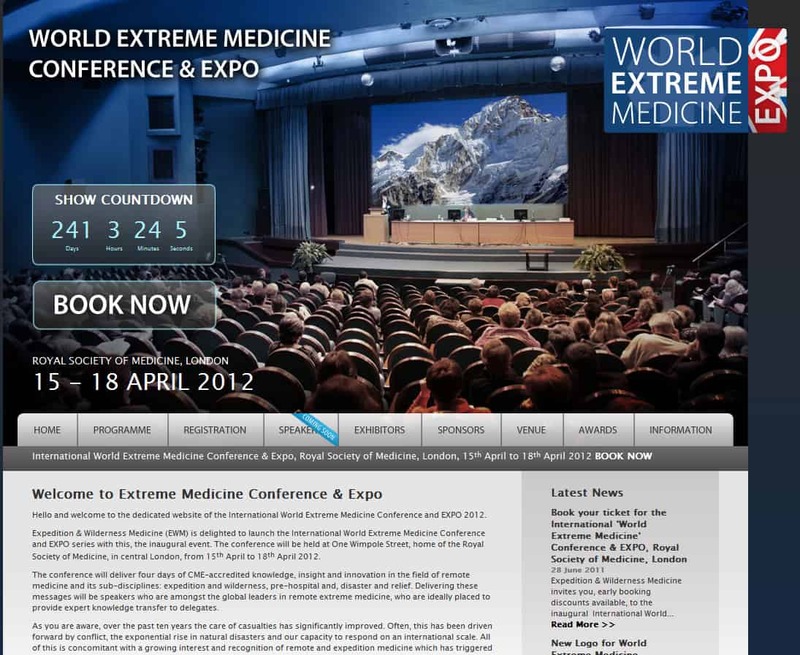 Expedition & Wilderness Medicine would like to introduce a major new International ‘World Extreme Medicine Conference and EXPO’ series starting in 2012. Find out more. CLICK TO VIEW THE EXPEDITION & WILDERNESS MEDICINE COURSES. Quote ‘Expedition Medicine’ to recieve very special RSM membership discounts.